Are you looking for a budget-friendly option to clean your sofas, armchairs or mattresses? Keen Clean can offer you great upholstery cleaning services in London at very affordable rates. If you’ve had an accident you can even make a booking at short notice and have our cleaners round to your home the same day to get your sofa, armchair or mattress clean in no time. Just call 020 7101 4325 for an instant free price estimate or to book our services. Using the latest advanced steam sofa cleaning equipment, Keen Clean provides on-site cleaning services that are tough on stains but gentle with your home furnishings. Our experienced cleaners deliver thorough, deep and lasting clean results with the utmost care for couches, mattresses, armchairs and other upholstered furniture. When you choose Keen Clean for your furniture cleaning, you get a professional service from start to finish! Once you book our local sofa cleaners you don’t need to worry about anything. Our technicians will take care of your chairs, sofas, mattresses or other house furniture using a deep steam cleaning system to extract dirt, remove stains and revive faded colours. Q: What is a deep upholstery cleaning? A: Deep upholstery cleaning is the professional treatment of any soft furniture in your home. This method can be used to sanitise sofa, armchairs, chairs, curtains, drapes and other upholstered items in depth. 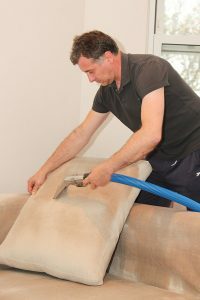 You can read more information regarding the upholstery cleaning service we provide on this link. Q: Do you steam or dry clean the upholstery? A: For most furniture types we steam clean & shampoo the upholstery, using non-toxic, eco-friendly solutions. Nevertheless, we would apply the dry cleaning method for delicate furniture fabrics. Q: Do you use chemicals during the upholstery cleaning service? A: Yes, we do use chemical products. However, all the cleaners we use are completely safe and non-toxic, designed especially for cleaning home furniture. But if you are sensitive to a particular chemical ingredient, please don’t forget to tell us when you book our upholstery cleaning service so we can use an alternative solution to clean your furniture. A: Yes, we do. We utilise only professional class cleaning tools and machines, as well as solutions and detergents. The products and equipment we use are from ProChem and Ashbys – both leading suppliers to the cleaning industry worldwide. ProChem products are non-toxic, eco-friendly, and safe to use in households with children, allergy sufferers, or pet animals. Q: How long does it take for my upholstery to dry after steam cleaning? A: Upholstery made from wool and wool blends can take between 4 and 7 hours before it’s completely dry. All other fabric types need between 3 to 6 hours to dry. Q: Can you remove stains from the upholstery? A: The effectiveness of the stain cleaning products depends on the origin of the stain. However, most of the time, we can remove completely even old stubborn stains. And although not 100% of the unsightly spots can be cleaned, our upholstery cleaning team will do everything to remove them from your furniture. Q: Can I book upholstery cleaning on weekends? A: Yes, you can. We are working seven days a week, and we are available on bank holidays too, and it will not add up any extra money to your final bill. A: The upholstery cleaning prices quoted on our website don’t include any parking or congestion charges. That is why it is best if you can provide a free-of-charge parking place near your property. Otherwise, we would kindly ask you to take care of the parking fee for our vehicle, while our colleagues work at your property. A: You can pay for our upholstery cleaning service with cash, as well as with credit and debit cards. We also accept bank transfers. Give us a call now on 020 7101 4325 to book our professional upholstery cleaning services, even on the same day. Our lines are open 24 hours a day, seven days a week, so we can take your booking any time of the day or night. Get your price quote for a London sofa cleaning service instantly and talk to our friendly office assistants about our great discounts on combined services.